At first glance at these titles I was expecting to see only strings listed among the players, but no: the bass clarinet raises its beautiful, though rather heavy profile, again for Perelman for Strings 2, while he plays the part of a ‘cello in a string quartet for Strings 1. 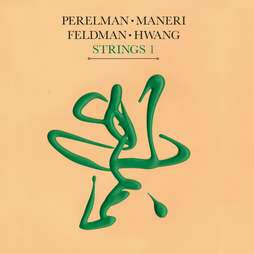 Perelman already has a particular working relationship with Mat Maneri, with six albums to their names in the last five years. Interestingly, the tenor and the ‘cello share some similarities of tone and vocal utterance, so it’s not surprising to hear him playing the ‘cello role alongside of Maneri’s viola. Hank Roberts (‘cello) is a well-established New York musician in his ventures with similar artists: Tim Berne alto sax, guitarist Marc Ribot and saxophonist and multi-instrumentalist John Zorn. Bass clarinettist Ned Rothenberg has also worked extensively in that musical environment which prefers to live at the forefront of experimentation or innovation. The music of course is entirely unorthodox, arising naturally and spontaneously from radical, aesthetic innovation. It depends on new and unusual or experimental ideas, and rejects any contribution from music which is scored or even sketched in any way with regard to arrangement, harmonic outline, theme or measure. These two albums, in common with any of Perelman’s output, will repay your close attention.